Quality content requires serious investments of time and energy. If you’ve ever written a blog post, designed an infographic, or put together a guide, you know that creating original material is no easy task. How can you make sure that your hard work doesn’t go to waste? The best way is to spend time finding out what your audience wants before creating content. Even if you personally find a topic that fascinates you or think your idea is incredible, that’s no guarantee that everyone (or anyone) else will agree. By monitoring or getting involved with the conversations taking place within your industry or niche, you give yourself a much better chance of creating content that people will find relevant, interesting, and worth sharing or linking to. Keep reading to find out where these conversations are happening, and how you can use them as a source for ideas that your audience will connect with. You already know a lot about your industry — or at least you should, if you are writing about it. You might even consider yourself an expert. But that doesn’t mean that you should stop learning! If you’re in an industry like marketing or technology, you know that the landscape changes on an almost daily basis. Even if you aren’t in one of these industries, there are still new developments happening and events taking place. So you need to stay informed about what’s going on — otherwise, your content won’t give you the opportunity to connect with your audience. Considering that 83% of B2B marketers have a content marketing strategy, it’s more likely than not that other people are already writing about your field. Blogging is one of the most popular forms of sharing industry knowledge, so blogs can be an excellent way to gauge what topics are being discussed. If you know who your competitors are, take a look at what they’re doing with their blogs. This isn’t to say that you should steal their ideas, but you should see what works and what doesn’t work for them. More importantly, see if you can figure out what’s missing. If you can identify a gap in the information they are providing their readers, that could be an excellent opportunity to address a topic that hasn’t already been discussed. 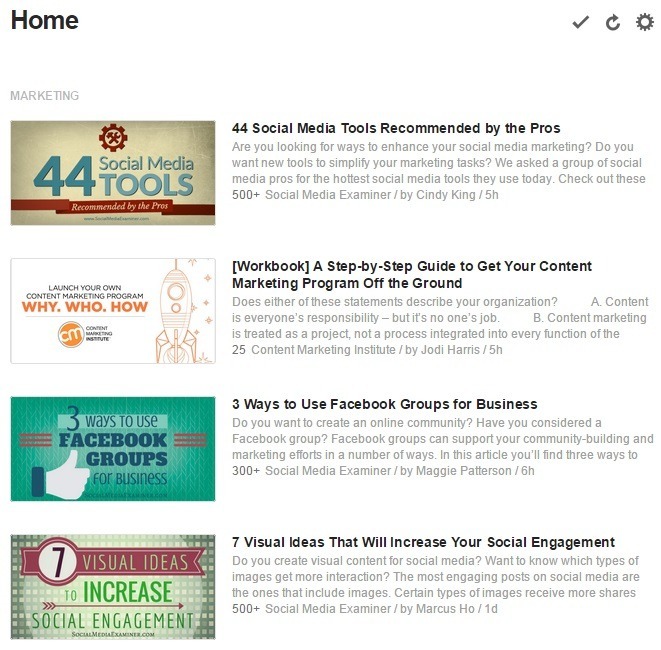 If you’re not sure who the popular bloggers and sites are in your industry, Feedly can be extremely helpful. It’s essentially an aggregator of RSS feeds, and you can choose specific topics or individual blogs that you want to appear in your feed. This will help you identify the top sites writing about your field. The comments sections of blogs and articles can also be a great resource. After all, the people who care enough to leave comments are the people who are active participants in the discussion surrounding your industry. These are the ones you want to interest with your content, so reading what they have to say can provide you with valuable insight. Look for commenters who disagree with the author, and especially for ones who raise additional questions. If you can come up with a way to answer those questions, or simply to explore another side of the topic, that could make for a great piece of content. If you have your own blog, you should also be sure to keep up with your own readers’ comments. You can use them to gauge interest in particular topics, and also to get ideas for future posts. Social media is another great tool for keeping up with the conversations taking place in your industry. Larger platforms like Facebook and Twitter have a much farther reach than most blogs and news sites and tend to generate more engagement, which can help you get a more rounded picture of certain topics. You’ll have to spend some time figuring out which companies and pages related to your industry have large followings, but it can be worth it if their posts generate a lot of discussion. Go look at the Facebook pages of large brands in your field, whether you consider them competitors or not. You may not have an audience on your own page willing to debate or ask questions, but larger companies do. After Search Engine Journal made a post about Google trying to rank sites based on accuracy, a few commenters speculated on how exactly it would work. Although you won’t have answers for every question in the comments section, you might come across one or two that fall within your area of expertise. If something seems like a good content idea, go ahead and join the conversation. It doesn’t have to be anything too formal, but ask commenters if they would read an article or blog post on the topic they’re discussing. If they say yes, start writing! You not only have confirmation of your audience’s interest, but a few potential readers if you go back and share a link once the post is published. You probably already know who the key players in your industry are. If not, spend some more time looking for popular blogs and news sites. Follow their authors and editors on Twitter and see what they are tweeting about. Following content creators and waiting for them to tweet isn’t enough to get a sense of the discussions taking place, though. Take advantage of Twitter’s easy search function and search for keywords related to the topics you write about. You’ll be able to see what people are saying about them, as well as identify popular hashtags that could come in handy when it’s time to promote your content. Considering that LinkedIn is more of a professional network, it can be a great resource if you are trying to appeal to experts in your field. There are thousands of groups on the platform made up of users with similar skills and careers, so you should be able to find a few that relate to your industry. Once you join a group, look through the discussions taking place. I joined the “Marketing Communication” group, and its 300K+ members generate a lot of conversation. Some of the questions and topics are very specific, while others are a bit more broad and philosophical, but both types can be a good way to get you thinking about potential topics. You obviously won’t want to answer every single question with an entire article or infographic, but you can at least see what professionals in your field are talking about. Similar to social media, forums are an excellent place to see what people are talking about. They might even be better, considering that discussion is the only thing that takes place on most of them. There are many different forums on the Internet, and you can probably find a few that are industry-specific if you do a quick Google search. But reddit and Quora are two comprehensive sites that are almost guaranteed to have users discussing your industry. If you’ve never used reddit, it’s basically a gigantic forum where anyone can post text, photos, or links to articles and websites, and other users can “upvote” or “downvote” them. These posts are categorized in subreddits, or pages dedicated to specific topics. The more upvotes a post has, the higher it will appear in the subreddit. This might sound a little confusing to someone who’s never used it, but reddit is pretty straightforward once you spend some time looking around. It’s also very comprehensive, and no matter what your industry, there’s a very good chance that there are entire subreddits dedicated to it. Not every post is going to give you inspiration for your next blog post or infographic, but think about how you could take the discussions generated by more popular ones and use them to create content. If nothing else, reddit will certainly get you thinking outside of the box. 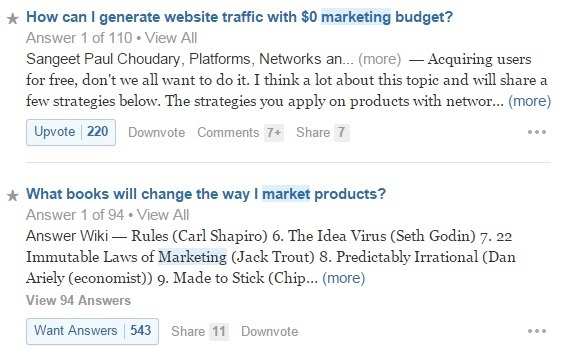 Although it isn’t a forum in the traditional sense, Quora is another great place to find content ideas. The idea behind it is simple – users ask questions and other users answer them. Much like reddit, users can upvote and downvote questions and answers. There are questions on virtually every topic you could possibly think of, and the site’s format naturally encourages discussion. Doing a few searches for terms related to your industry should return some interesting questions, and even if they haven’t generated much discussion, you could always use the questions themselves as content ideas. After you’ve spent some time paying attention to blogs, social media, and forums, you should have a pretty good idea of what people in your industry are talking about. You should be able to identify what knowledge is already out there, and hopefully a few gaps in that knowledge that you can fill with your content. It will take some time to come up with a system for monitoring discussion that works for you, but getting to know your audience is entirely worth it. The effort you make will pay off when your content is well-received, and is time much better spent that coming up with material that no one can connect with. Have any tips of your own to help our readers find content ideas that their audience will love? Or do you have questions about the methods I shared in this post? Let me know in the comments below. I would love to hear from you!